Great news folks — we’ve synced up with the team over at LeagueLineup.com to bring you the ease of their data entry platform with the data analysis of StatFame! To get the ball rolling, follow these simple steps — or click the video below to watch a walkthrough! Step 1: Login to you StatFame account. 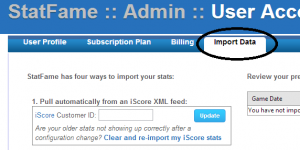 Step 2: Click the “Import Data” tab from your homescreen. Step 3: Scroll down to the “Provide a box score URL” section. Step 4: Get your LeagueLineup homepage (example is provided on the page) -but you’d be better off importing your own data we bet! 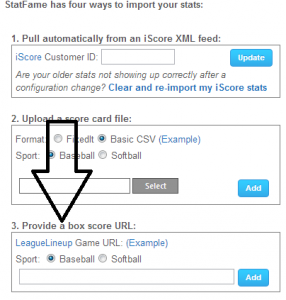 Step 5: Copy that URL from LeagueLineup and paste it in the URL box in Step #3! Step 6: Make sure you check whether it is a baseball or softball game as this determines where you stand on the League Leaders page and granting you your badges and eXperience Points! Step 7: Wait about 3 seconds and it will appear to you game log on the right of your homescreen!